Springtime is a great time for carpet cleaning! The winter months have us tracking mud and dirt indoors, some of which gets trapped deep in the fibers of our carpeting. Unfortunately, most vacuum and carpets cleaners don’t reach the deep down dirt. Coupled with windows and doors that are closed for months on end, the air quality in our homes starts to diminish and allergies can start to flare up. OxiGreen in Langhorne, PA can help you remedy these problems! Our long lasting, deep carpet cleaning extracts the dirt, dust mites, bacteria and other pollutants stuck in your carpets. It restores the matted, high traffic areas and has your carpeting in tip-top shape once again. Not only that, but at OxiGreen in Langhorne, PA, we use only “green” cleaning agents, which are biodegradable. This means that our carpet cleaning process is safe for our environment and your family. We are happy to be one of the area’s best pet and baby safe carpet cleaning companies. Our process will never leave behind any toxic residue that could endanger the health of your children or pets, who spend so much time playing and relaxing on the carpeting. 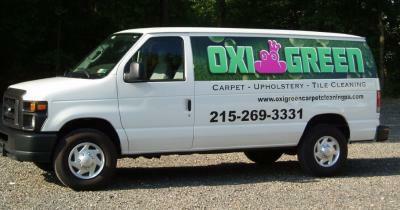 Call OxiGreen in Langhorne, PA at 215-269-3331. We are here to answer questions and schedule appointments, either for an in-home carpet inspection or carpet cleaning. Same day appointments are available to all of our commercial and residential customers. Let us show you what OxiGreen can do for you! Our process is very fast drying, allowing you to return to your normal, everyday activities with and hour or two. Our carpet cleaning also comes with a great guarantee. If you are not completely satisfied, we will come and do it again! We want you to be one of our happy, repeat customers!